The environment authority has cleared the way for the offshore relocation of a St Paul’s Bay tuna farm, the last such farm that is still without an approved site. Malta Mariculture Ltd has applied to relocate eight of its tuna pens previously operating from St Paul’s Bay to a new site offshore from Sikka l-Bajda, reducing the number of cages to six while retaining the same volume. The pens were removed from St Paul’s Bay in May ahead of a deadline agreed with the Planning Authority. The application is intended as a temporary measure for two years while operators await the setting up of a designated North-East Aquaculture Zone, complementing a similar site in the south which is already operating at full capacity. The proposed site is located within two Natura 2000 sites, designated as a marine Special Protection Area for seabirds, and a marine Special Area of Conservation under the Habitats Directive. The area is within the rafting zone of the Yelkouan shearwater, which occupies its largest colony at the Rdum tal-Madonna cliffs, and Birdlife has expressed concern over the effect of the relocation on this seabird population. But a screening report by the Environment and Resources Authority (ERA) found that “no significant environmental impacts… on the integrity of the habitats, species and the Natura 2000 sites as a whole are envisaged, provided that good practice mitigation measures are duly applied”. 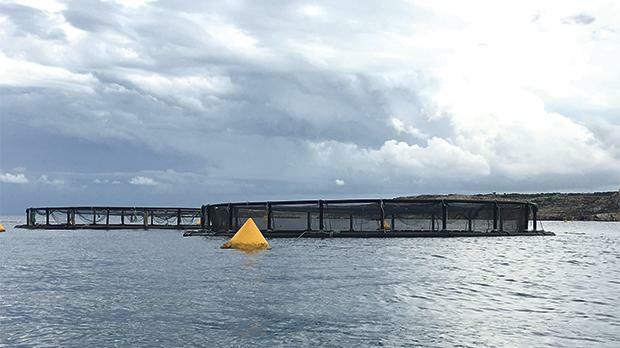 If approved, the offshore fish farm will comprise four cages with a diameter of 50 metres and a net depth of 35 metres, and two larger cages with a diameter of 60 metres and a depth of 38. Together, they will cover an area just under two hectares, five kilometres from the nearest landfall. The cages will be some 800 metres from a second farm operated by AJD Tuna, which was given permission to relocate from Comino in June. The PA said the relocation would help to reduce the impact of polluting discharge on inshore locations. Last September, the Planning Board revoked 10 fish farm permits from four operators around the island due to illegalities and harmful environmental practices, including the oily slime that plagued beaches last summer. The two operators in the south of the island have relocated to the existing aquaculture zone as agreed with the PA. The issuance of a temporary permit for the relocation of the AJD farm from Comino left only the status of the St Paul’s Bay cages unresolved.